Soul Food for Young Adult Communities, 2nd Sunday of Easter, April 7, 2013. ‘Community’ may be two or 12 or…. and Sinead, Mark and Friends are young adults! Today is Doubting Thomas’ day, and may people are very glad about the same ‘Thomas, the Twin’ as he was called. Thomas appears a number of times in the Gospels, but today’s story, in John 20, is the best known. He refused to believe! Doubt is part of our human condition, and rightly so. We need to check things out, are people trust-worthy? Is this possible? Does it make sense? and so on. Thomas was in that situation,- he wasn’t in the Upper Room (where the doors were LOCKED, for fear of being attacked, arrested and maybe crucified also, like the Master! ), -he wasn’t in the room on Easter Sunday when Jesus came and stood in the midst of them all, and said ‘Peace be with you!’ (- welcome words, considering they had almost all run away from the Garden of Gethsemane and left Jesus alone.) When the others told Thomas about seeing Jesus, risen, he refused point blank to believe them. ‘No way, Jose!’ So, a week later, again they were gathered and Thomas was there. Jesus came and stood among them. He turned to his friend Thomas and held out his hands,- with the holes from the nails- and invited Thomas to put his finger in the wounds, and even to put his hand into the wound in the side of Jesus. Thomas was dumbfounded. He was truly in the presence of the Master. And, in response, he said those wonderful words, beloved of Christ’s followers ever since, ‘MY LORD AND MY GOD!’ This was his act of faith. He saw, and he believed. We don’t see, but we believe the people who were there and who told us about that moment. So, Sinead, Mark, and friends, honour your own questions, your own doubt, your own faith-journey. Check things out. Is this believable? Is Jesus believable? 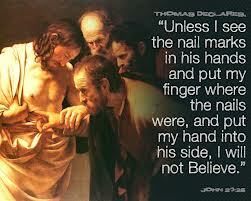 Maybe, be like Doubting Thomas, until you meet the Lord in your own time. Want to meet him, and wait to meet him. He will surprise you when he shows himself to you, maybe in the guise of some person or persons in your life. ‘Christ is Risen! He is truly Risen!’ AMEN! ← Soul Food for Hungry Adult Communities: 2nd Sunday of Easter, April 7, 2013.